Your teen’s dream school is in your financial reach! Do you want to send your child to the school of her dreams, but are worried about how to pay for it? Pay for College without Breaking the Bank! You can greatly increase the aid for which you are eligible. Even millionaires and those who earn high salaries can qualify for financial aid. Colleges will not only fight for your students, but PAY for them to attend as well! Let National College Planners show you how! Every parent of a college bound teen needs to attend this workshop. All parents faced with the prospects of paying for college will benefit from our information and expertise. 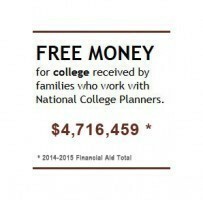 If you’ve been told you make too much money to qualify for free financial aid that does not mean that there are not thousands of dollars available to you. This is the perfect opportunity to learn about the thousands of dollars for which you are eligible. Don’t miss it! Take the stress out of planning for college. It’s an exciting time for both students and parents alike. Change the question, “Can we?” to “We CAN!” Sign up today!